Only a Magic Wand Can! Have the islanders lost faith in the Administration? Port Blair, Sept. 4: Just about two months after the new Lt. 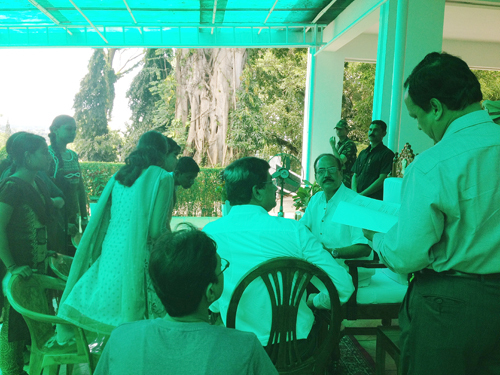 Governor, Lt. Gen. (Retd) AK Singh took over; the air seems to smell positive in the islands. The lost hopes rekindle, raising expectations of the general islanders, who wished to have them heard. Suggestions for development of the islands are pouring in social media, many of which the Lt. Governor himself responds to. It is not only this; grievances of islanders are flooding in the Raj Niwas, with people wanting to meet the LG face to face. The Online (HelpDesk@LGoffice) too is not spared, and on an average 7-10 grievances are submitted by the general public on daily basis. While many islanders have rejoiced over the appointment of the new LG, there are also few who have expressed that their grievances posted in the online LG’s Help Desk are not being addressed. Wanting to have firsthand information on the proceedings of the Tuesday’s Public Hearing, Andaman Chronicle sought an appointment to witness the proceedings and to enquire on the action taken on grievances posted online. It was 3rd of September 2013. As usual, the Tuesday’s Public Hearing begins at around 11.00 am. Atleast fifty people are seen eagerly waiting to see the LG; right from ailing patients, PRI members and College Students. Each of them are warmly received at Raj Niwas, served with tea and given ample time to speak out. As the hearing begins; the polite language, humble gesture and an immediate action on genuine grievances by the LG seems wins the hearts of the islanders, thus making the Tuesday’s ‘Darbar’ an all time hit. “I am a poor lady. I am suffering from Piles. I don’t have money to go to the mainland for treatment”, pleads an old lady, exhausted after a distant travel to make it to LG. Pulling out a shabbily folded medical report, the lady places it before the LG. Next comes an old man, limping with a folder tucked under his armpit. Pulling the chair, he sits on it with great discomfort. What happened to your leg, asks the LG. And the man replies, I am suffering from Spondylitis for almost a decade now. I have been referred to the mainland and I need money. Have you checked yourself with AYUSH, asks the LG. And the man says; he is not aware of it. Doctor Sahab told me to go to mainland… he mumbles. Hearing the grievances; immediate instructions are passed to call the concerned officials of Health Department; the LG wanting to know if the Doctors in the islands are capable of treating Piles and Spondylitis. Health authorities arrive on the spot, assuring the LG that the ailments will be treated in the islands itself. But the matter doesn’t end here… A strong voice of the LG warns, “Ensure that the patients are not ill-treated for having approached me”. More to follow; a group of college students are excited to meet the LG. They speak in a common voice; we want more seats for post graduation so that we too get admission. “What do you have in mind after completing your post graduation and what if you don’t get admission?” asks the LG. “Do you have any plans for your future?” They answer; we just want admission for Post Graduation. One among them speaks out, “Sir I did not receive the mark sheet of my fourth semester still”. Have you approached your Principal, the LG asks and he replies, yes but in vain. And there goes a call to the concerned Principal with a strong message from the LG. Similar grievances fill the Darbar and the LG hearing them one by one, for hours together, with utmost care, passing instructions to the concerned authorities on the spot to redress the grievances. “It is sad that the people have lost faith in the Administration and I’m doing my best to revive the lost faith”. “I don’t have a magic wand that can change things overnight but I’m positive”, he says when being asked his reaction to the kind of grievances pouring in. On the other hand, when Chronicle approached the Secretary to LG, Shri SN Misra to find out about methodology adopted to resolve online grievances, it was learnt that all grievances were being addressed to. It was being marked to the concerned departments with instructions to resolve it in a set time frame. It was also noticed that the bulk of the complaints are from one or two individuals who, it appeared, are habitual of filing complaints. Most of the complaints were neither specific nor had any evidence which substantiates and seemed to target at certain officials/ departments. The Secretary to LG explains, “Such large number of petitions from couple of people on corruption has resulted in a setback to genuine grievances of the people, thereby defeating the very purpose for which the LG’s Help Desk was set up”. “We do not discourage anyone from placing their grievances. But there are different forums. The LG has taken personal interest in strengthening the Vigilance Department. If the complains regarding corruption is genuine and has some substance, complainants should feel free to approach the Vigilance Department”, Misra adds. With the kind of approach the Lt. Governor has towards the Islanders, it can be expected that the islands would witness a new era that would be cherished. The fresh whiff of optimism that emanates from Raj Niwas is appreciable and now the onus is on the Islanders to appropriately grab the opportunity and give space and time for the new Administrator to perform.